The cellular network that my smartphone connects to normally delivers 10-40 Mbit/s. That is sufficient for video-streaming and other applications that I might use. Unfortunately, I sometimes have poor coverage and then I can barely download emails or make a phone call. That is why I think that providing ubiquitous data coverage is the most important goal for 5G cellular networks. It might also be the most challenging 5G goal, because the area coverage has been an open problem since the first generation of cellular technology. 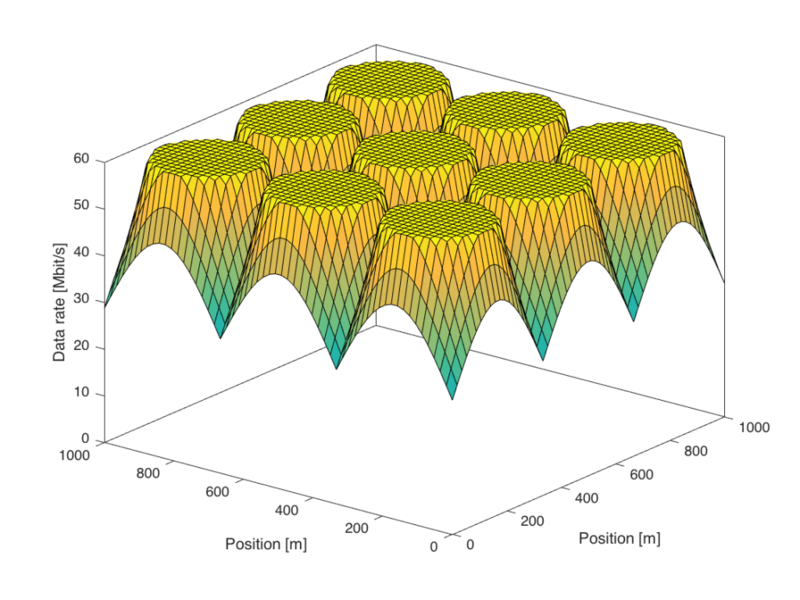 Figure 1: Variations in the downlink data rates in an area covered by nine base stations. This figure considers an area covered by nine base stations, which are located at the middle of the nine peaks. Users that are close to one of the base stations receive the maximum downlink data rate, which in this case is 60 Mbit/s (e.g., spectral efficiency 6 bit/s/Hz over a 10 MHz channel). As a user moves away from a base station, the data rate drops rapidly. 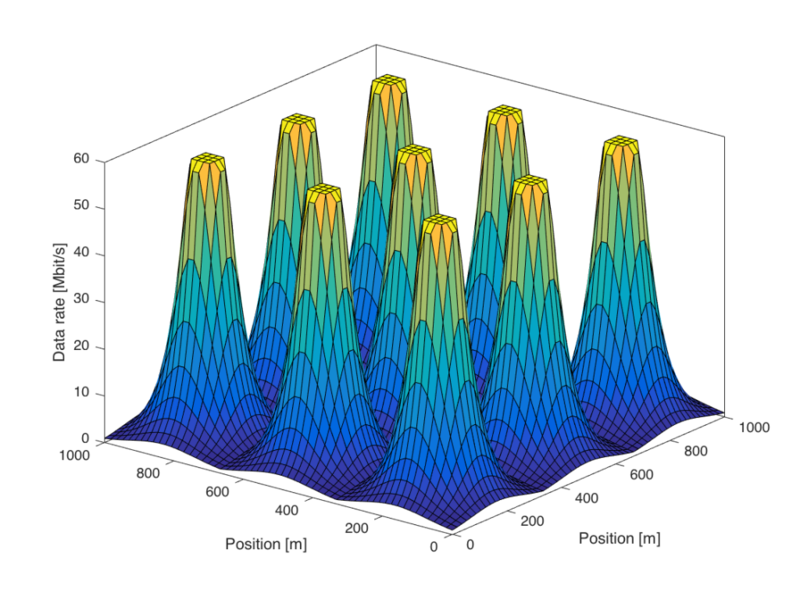 At the cell edge, where the user is equally distant from multiple base stations, the rate is nearly zero in this simulation. This is because the received signal power is low as compared to the receiver noise. What can be done to improve the coverage? Figure 2: The transmit powers have been increased 100 times as compared to Figure 1. There are some visible differences as compared to Figure 1. First, the region around the base station that gives 60 Mbit/s is larger. Second, the data rates at the cell edge are slightly improved, but there are still large variations within the area. However, it is no longer the noise that limits the cell-edge rates—it is the interference from other base stations. The inter-cell interference remains even if we would further increase the transmit power. The reason is that the desired signal power as well as the interfering signal power grow in the same manner at the cell edge. Similar things happen if we densify the network by adding more base stations, as nicely explained in a recent paper by Andrews et al. 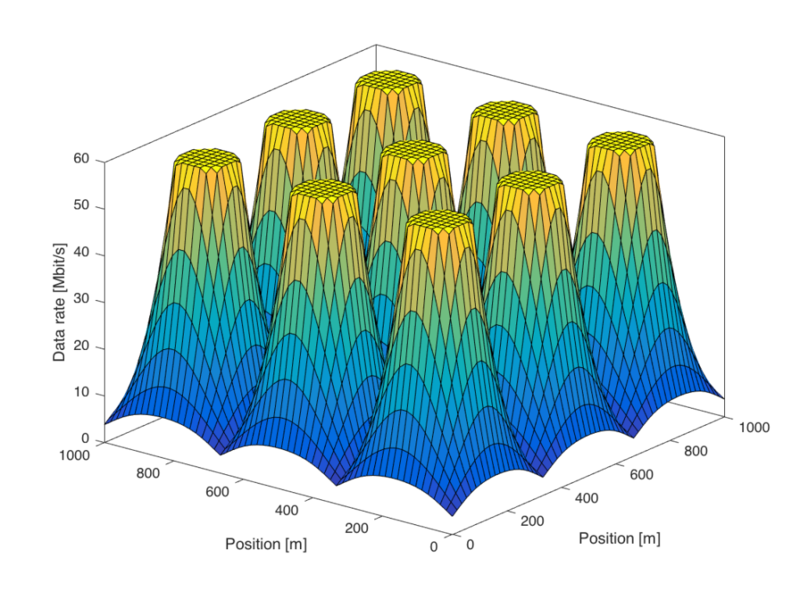 Figure 3: The number of base station antennas has been increased from 1 (as in Figure 1) to 100. Figure 3 shows that the data rates are increased for all users, but particularly for those at the cell edge. In this simulation, everyone is now guaranteed a minimum data rate of 30 Mbit/s, while 60 Mbit/s is delivered in a large fraction of the coverage area. In practice, the propagation losses are not only distant-dependent, but also affected by other large-scale effects, such as shadowing. The properties described above remain nevertheless. Coherent precoding from a base station with many antennas can greatly improve the data rates for the cell edge users, since only the desired signal power (and not the interference power) is increased. Higher transmit power or smaller cells will only lead to an interference-limited regime where the cell-edge performance remains to be poor. A practical challenge with coherent precoding is that the base station needs to learn the user channels, but reciprocity-based Massive MIMO provides a scalable solution to that. That is why Massive MIMO is the key technology for delivering ubiquitous connectivity in 5G. The post is interesting, I appreciate it. Now how can we estimate the cost of using massive mimo in terms of space, in other words will implementing massive MIMO not be challenging in small platform base stations? Emil Björnson, Erik G. Larsson, Thomas L. Marzetta, “Massive MIMO: Ten Myths and One Critical Question,” IEEE Communications Magazine, vol. 54, no. 2, pp. 114-123, February 2016.